A wide array of kaolin (also known as China Clay) products are available. These vary in plasticity, crystal and surface chemistry, particle shape and size, flow properties, permeability, etc. However the most common varieties most people will see are two: kaolins intended for plastic bodies or casting ones. 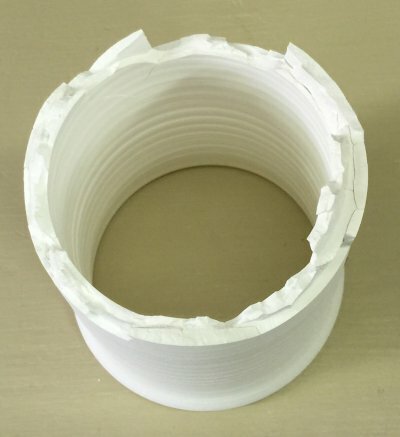 Plastic kaolins can rival the workability of a ball clay, casting ones can be so short that it is difficult to even wedge or roll them without the plastic mass falling apart. Strangely, non-plastic kaolins are not necessarily whiter burning. Pure kaolin is the clay of choice for bodies that need to be clean and white. Many porcelains contain only a kaolin mix as their clay complement. But kaolins have relatively low plasticity when compared to other raw clay types. Thus in non-casting plastic forming bodies it is often not possible to achieve enough plasticity employing kaolin alone. Additions of ball clays, bentonites and other plasticizers are thus common. Where translucency and whiteness are paramount, highly plastic kaolins and white burning ball clays and bentonites can be used . 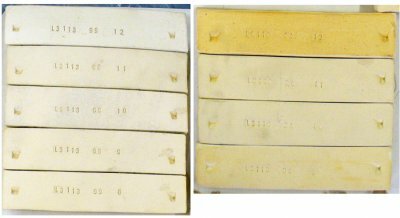 It is possible to make a plastic throwing body using 50% kaolin only, however you must choose one of the highly plastic varieties such as #6 Tile. Even then you will likely need a little bentonite to augment the kaolin. There is a huge range in kaolin plasticities, test for yourself to find out. 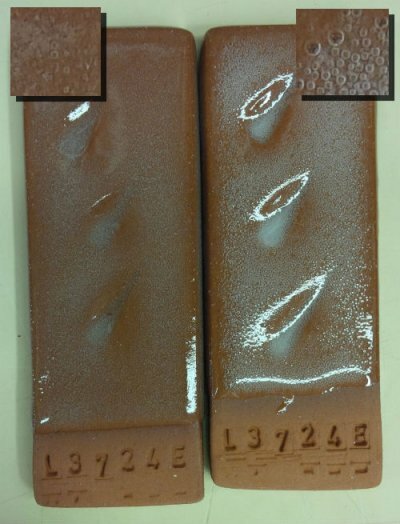 Ball clay and kaolin test bars side-by-side fired from cone 9-11 oxidation and 10 reduction. The white one feels smoother, but it is actually far coarser. Why? 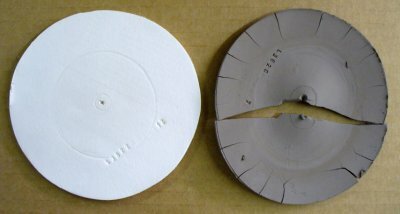 Large particle kaolin (left) and small-particle ball clay (right) DFAC tests (for drying performance) demonstrate the dramatic difference in drying shrinkage and performance between these two extremes (these disks are dried with the center portion covered to set up a water content differential to add stresses that cause cracking). These materials both feel super-smooth, in fact, the white one feels smoother. But the ultimate particles tell the opposite story. The ball clay particles (grey clay) are far smaller (ten times or more). The particles of the kaolin (white) are flatter and lay down as such, that is why it feels smoother. What happens when you dry and bisque a piece made of pure kaolin? 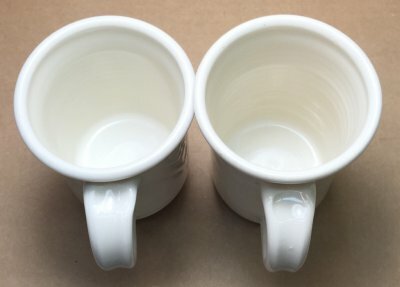 The way in which the walls of this bisque fired kaolin cup laminate reflect the plately and uniform nature of the kaolin particles. Because they are lining up during the wedging and throwing process, the strength to resist cracks is better along the circumference than perpendicular to it. The bonds are weak enough that it is very easy to break it apart by hand (even though it is bisque fired). The worst laminations were at the bottom where wall thickness was the most variable and therefore the most drying stresses occurred. However, if this kaolin were blended with feldspar and silica, this lamination tendency would completely disappear. 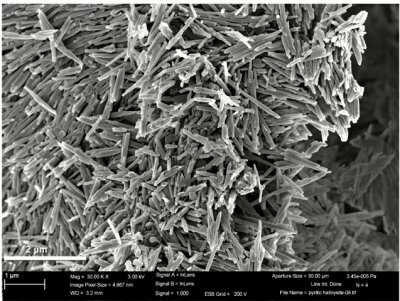 Electron micrograph showing Dragonite Halloysite needle structure. For use in making porcelains, Halloysite has physical properties similar to a kaolin. However it tends to be less plastic, so bodies employing it need more bentonite or other plasticizer added. Compared to a typical kaolin it also has a higher fired shrinkage due to the nature of the way its particles densify during firing. However, Dragonite and New Zealand Halloysites have proven to be the whitest firing materials available, they make excellent porcelains. The kaolin arrives on a semi of 880 bags. First step: Record the date code. 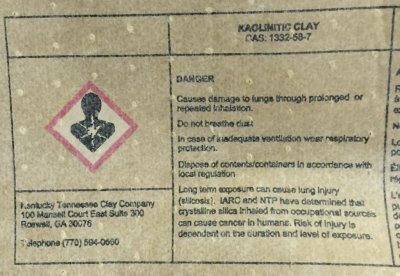 A shipment EP Kaolin has arrived for use in production of porcelain and stoneware bodies. Of course, this needs to be tested before being put into product. But how? The first step is to create a new recipe record in my Insight-Live account, and find their production date code stamp on the bag. Hmmm. It does not have one! OK, then I need to record the date on which we received it. We need to save a bag on every pallet and sieve 50 grams through 100 mesh (to spot contamination). Then we'll make test bars (of all the samples mixed) to fire across a range of temperatures (to compare fired maturity with past shipments). We do a drying performance disk also, it also shows soluble salts. The cone 6 porcelain on the left uses Grolleg kaolin, the right uses Tile #6 kaolin. The Grolleg body needs 5-10% less feldspar to vitrify it to zero porosity. It thus contains more kaolin, yet it fires significantly whiter. Theoretically this seems simple. Tile #6 contains alot more iron than Grolleg. Wrong! According to the data sheets, Grolleg has the more iron of the two. Why does it always fire whiter? I actually do not know. But the point is, do not rely totally on numbers on data sheets, do the testing yourself. 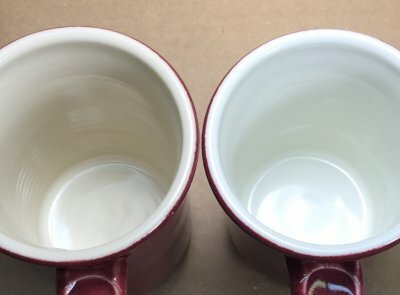 Cleanest kaolin porcelain vs. ball-clay-only porcelain! These cone 6 clear-glazed porcelains demonstrate just how white you can make a porcelain if you use white burning kaolins and bentonites instead of ball clays. Both contain about 40% clay. The one on the left employs New Zealand kaolin and Veegum plasticizer, the one on the right Kentucky ball clays (among the whitest of ball clays in North America) and standard bentonite. Both are zero porosity. 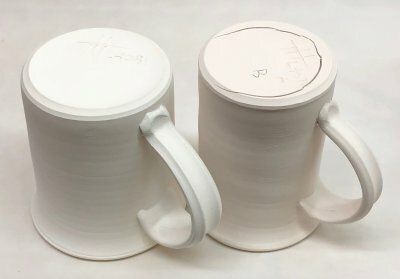 The glaze surface is a little more flawless on the right one (possibly because ball clays have a lower LOI than kaolins). Cone 6 kaolin porcelain verses ball clay porcelain. Typical porcelains are made using clay (for workability), feldspar (for fired maturity) and silica (for structural integrity and glaze fit). 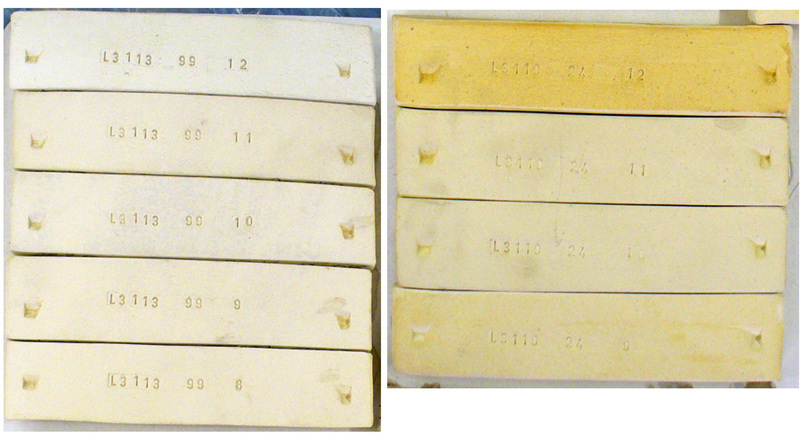 These cone 6 test bars demonstrate the fired color difference between using kaolin (top) and ball clay (bottom). The top one employs #6 Tile super plastic kaolin, but even with this it still needs a 3% bentonite addition for plasticity. The bottom one uses Old Hickory #5 and M23, these are very clean ball clays but still nowhere near the whiteness of kaolins. Plus, 1% bentonite was still needed to get adequate plasticity for throwing. Which is better? For workability and drying, the bottom one is much better. For fired appearance, the top one. 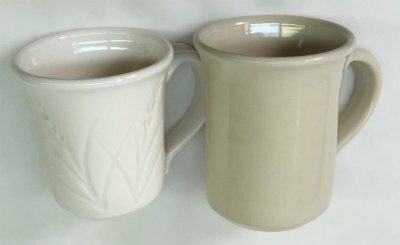 Left: A porcelain that is plasticized using only ball clays (Spinx Gleason and Old Hickory #5). Right: Only kaolin (in this case Grolleg). 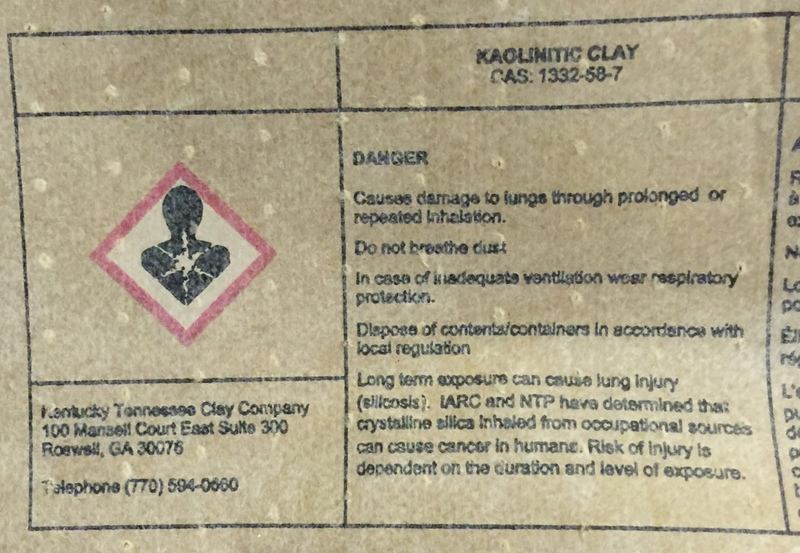 Kaolins are much less plastic so bentonite (e.g. 2-5%) is typically needed to get good plasticity. The color can be alot whiter using a clean kaolin, but there are down sides. Kaolins have double the LOI of ball clays, so there are more gasses that potentially need to bubble up through the glaze (ball clay porcelains can produce brilliantly glassy and clean results in transparent glazes even at fast fire, while pure kaolins can produce tiny dimples in the glaze surface if firings are not soaked long enough). Kaolins plasticized by bentonite often do not dry as well as ball clays even though the drying shrinkage is usually less. Strangely, even though ball clays are so much harder and stronger in the dry state, a porcelain made using only ball clays often still needs some bentonite. If you do not need the very whitest result, it seems that a hibrid using both is still the best general purpose, low cost answer. You may not fully appreciate what your clay body manufacturer has to go through to make clean porcelain for you. Every load of material that they receive has to be checked. We now have to check every pallet. This is the third semi-trailer load of material we have had contaminated (ball clays and kaolins are most vulnerable). When we phoned another manufacturer they checked their supply and it was contaminated also! Materials can also be contaminated by larger clay particles that disrupt the fired glaze surface. These chunks of metal were pulled out by magnets in the production line, a thousand boxes of porcelain are now garbage. It is too expensive to return a load, so it just becomes a loss. Bubbles in Terra Cotta transparent glazes. What to do? Two transparent glazes applied thickly and fired to cone 03 on a terra cotta body. Right: A commercial bottled clear, I had to paint it on in layers. Left: G1916S almost-zero-raw-clay glaze, a mix of Ferro frit 3195, 3110, calcined kaolin and a small amount of VeeGum T. The bubbles you see on the left are from the gas generated by the body. The ones on the right are from body and glaze. How can so many more bubbles be generated within a glaze? Raw kaolin. Kaolin loses 12% of its weight on firing, that turns to gas. Low temperature glazes melt early, while gassing may still be happening. So to get a crystal clear the raw clay content has to be as low as possible. Obviously, a white burning body made from refined materials would be even better. A good compromise: A red slip (or engobe) over a white burning body, it would generate far less gases because of being much thinner and still exhibit the nice red color. These test bars are fired at cone 10R. The top one is EP Kaolin, the bottom one is Old Hickory M23 Ball Clay (these materials are typical of their respective types). It is interesting that although the kaolin has a much larger ultimate particle size it is shrinking alot more (23% vs. 14%). This is counterintuitive to what should be happening. And another thing: the kaolin has a porosity of 0.5% and the ball clay is 1.5%. This is also counterintuitive. The kaolin should be more refractory since it contains less fluxing oxide impurities. In fact, both should theoretically be a lot more refractory than they actually are. Both of these are mixed 70:30 kaolin:feldspar. Left is a fine particled kaolin, #6 Tile. Right a coarser particled, less plastic material, EPK. During forming, the larger particles line up concentric to the center better. This causes the body to shrink more along radius lines than along tangent, producing these cracks. Many of these were made and they all cracking like this. We have to fight with the fibreglass industry to get kaolin! These are bags from three recent truckloads of 880 bags each. 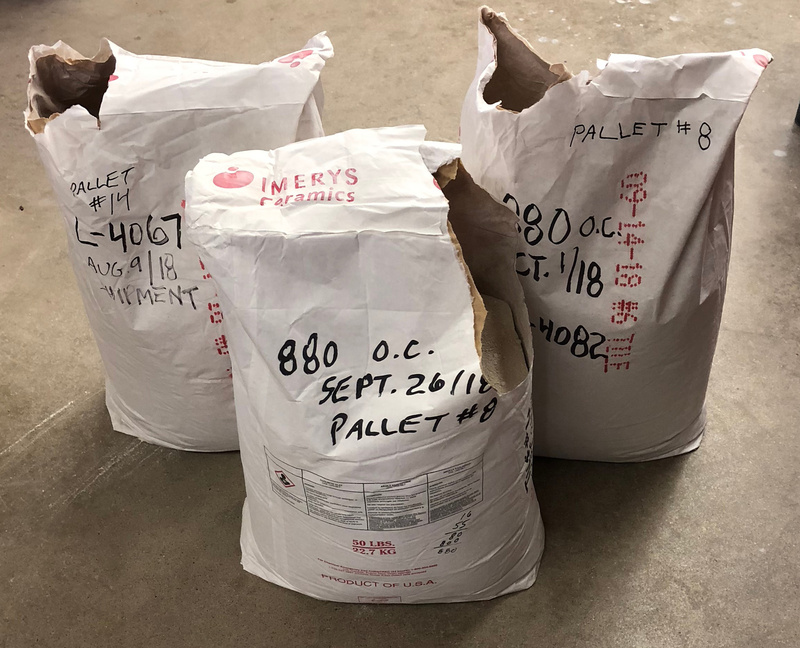 Order-delivery delays are getting longer and longer as the fibreglass industry is making more and more demands on kaolin suppliers. This means we have to store this material in larger quantities and for longer periods than in the past. And we must be more diligent in testing for consistency because manufacturers are catering to fibreglass instead of ceramics. 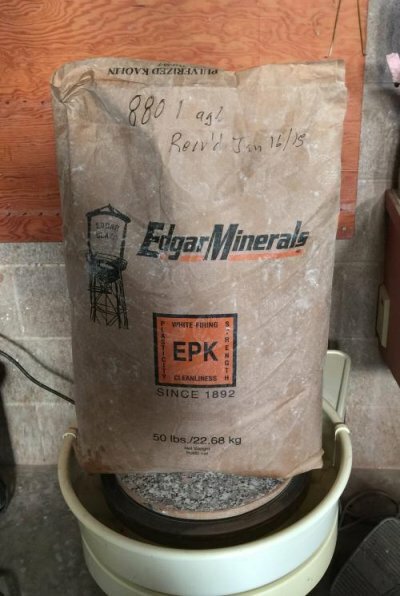 When this is coupled with the decline of ceramic manufacturing in North America it means maintaining and documenting the properties important to ceramics are becoming less important to kaolin manufacturers. (Materials - Parent) Kamec Kaolin - Originally from Harris Mining Co. or Kaolin, Inc.
(Materials - Parent) H-1 Kaolin - Originally from Harris Mining Co.
(Materials - Parent) Sparks Kaolin - Originally from Harris Mining Co.
(Materials - Parent) Klondike Kaolin - Legacy white kaolin from Edgar Bros. Co.
(Materials - Parent) VC-1 Kaolin - Legacy kaolin from Paper Makers Co.
(Materials - Parent) A-1 Kaolin - Legacy kaolin from Paper Makers Co.
(Materials - Parent) Richardsons Kaolin - Legacy kaolin from Paper Makers Co.
(Materials - Parent) M+M China Kaolin - Legacy kaolin from Paper Makers Co.